Region: This borer is most common in the East, but is common throughout North America. Life cycle: This borer produces one generation each year, overwinters as a grub, and pupates in early spring. Physical Description: The grub is 1 1/4 inches long, yellow to white with a flat area just behind the head, and is usually curved. The adult is a grayish brown, shiny beetle with a blunt head and is about 1/2 inch long. The eggs are laid in cracks in the bark. 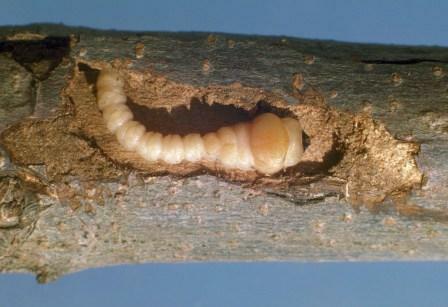 Feeding characteristics: The Appletree Borer enters the bark and remains there feeding until it is fully-grown. It then bores deeper into the wood. The overlaying bark is stained, but castings are not apparent. Vigorous trees are usually not harmed by this insect, but young transplants may die because of this pest. This insect is not limited to apple trees. It will also attack apricot, ash, mountain ash, beech, boxelder, cherry, chestnut, cottonoak, currant, dogwood, elm, hickory, horse chestnut, linden, maple, oak, peach, pear, pecan, plum, poplar, prune, sycamore, and willow. Controls: These beetles are drawn to sun-warmed trunks; therefore, shading the trunks of young trees with any type of shield or wrapping with burlap or cardboard from the soil to the lower branches will help to protect them from this pest. You can also apply a good coat of white exterior latex paint. Keep young trees well pruned so to have a low profile. If Borers have already started, you can dig them out with a sharp knife or a stiff wire. Since the borer will usually attack trees in poor condition, seal up wounds with tree paint and make sure you are supplying an adequate amount of compost and organic fertilizer.